Anti- tobacco campaigns have gained vast momentum in the past century, owing to multiple studies finding correlation between lung carcinoma and tobacco usage. The WHO has declared the 31 st of May as World No Tobacco Day in acknowledgement of this fact and the focal theme of 2018 is the impact of tobacco usage on cardiovascular health. A first step towards understanding the significance of this observance day is to assess global tobacco use and the effects it has. 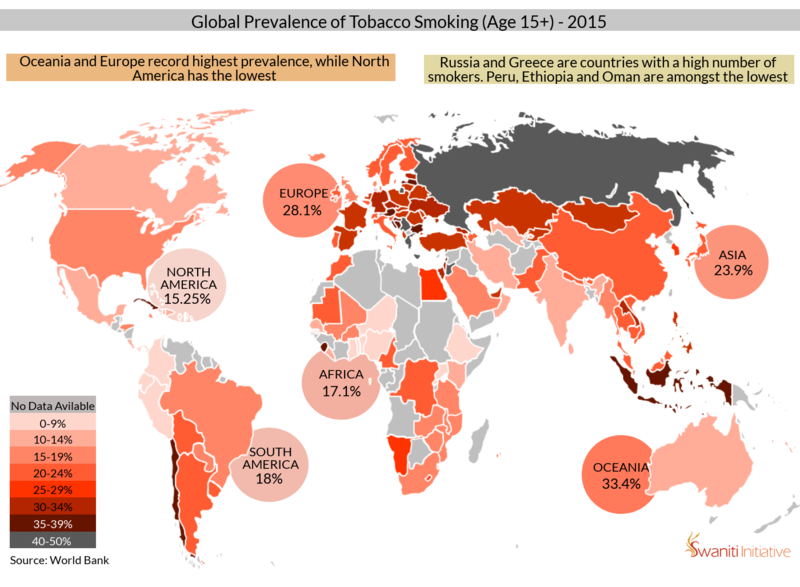 What are the trends in smoking prevalence globally? Increasingly, countries have recognised smoking as a public health crisis and have made targeted attempts at reducing smoking prevalence among their citizens, through concerted efforts in health education and taxation regimes. Most countries now have a smoking prevalence of less than 20% of their respective populations over the age of 15 years, and this is considerable progress made, given that these numbers hovered well above 25% for all nations merely two decades ago. While in the twentieth century smoking was most prevalent in developed countries with high per capita incomes, it has gradually shifted to countries with low incomes in the recent past. This points at a relatively higher level of awareness regarding risk and adverse effects of smoking tobacco among the wealthier population of the world. Additionally, developed countries are major growers and exporters of high quality tobacco, consuming which becomes a symbol of upward mobility in developing societies. The country- wise rate of consumption of tobacco for the world is depicted in the first infographic. 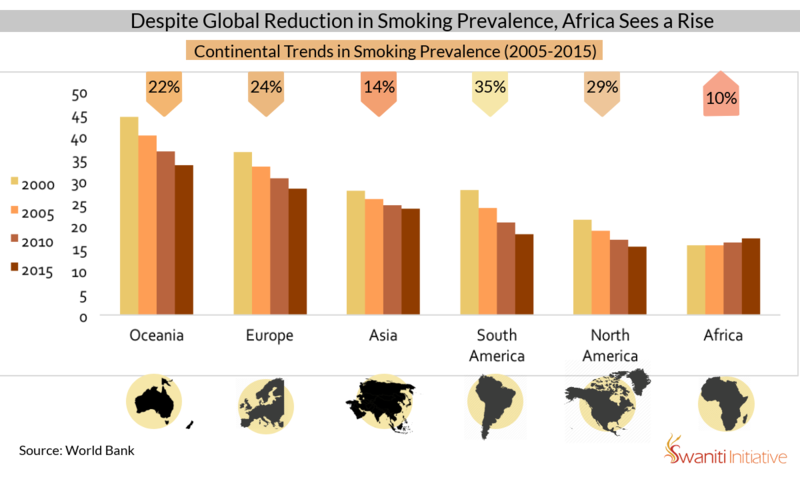 Globally, cigarette smoking has fallen uniformly across continents in the past fifteen years, with an exception of Africa, which has grown at 10%. The South American continent has reduced its smoking prevalence by 35%, while Asia has reduced by 14%. North America has had the least smoking prevalence and has made significant gains in reducing those numbers. Over the years, the gains made in cutting down smoking rates all over the world surpass the growth shown in Africa. The decade of 2000-2010 has witnessed a reduction of at least 10% in these continents. Is there a correlation between income and tobacco use? Exploring the relationship between income and smoking prevalence throws up interesting insights. Many countries with low Per Capita Income (PCI) seem to exhibit high levels of smoking. For instance, Sierra Leone, the poorest African nation in terms of PCI in USD for 2015, also has the highest smoking prevalence at 36%. However, in South America, this does not hold true, as high income countries also show proportionately high levels of smoking. High and middle income countries around the world have largely reduced smoking among their citizens by about 50% in the past 15 years, which highlight landmark achievements in the direction of such efforts. This trend is far more pronounced in Asia than elsewhere, where, despite high degree of internal diversity, countries have by and large succeeded in curbing smoking rates. Asian countries such as India and Indonesia consume tobacco in other forms such as chewing tobacco or clove cigarettes, which signal a correlation between unaffordability of machine or hand- rolled cigarettes and low per capita income. What is the trend in India? In India, states exhibit a similar correlation, with lower per capita income states registering higher usage of tobacco. However, a nuanced look will reveal that smokeless tobacco is more common in these states than smoking tobacco, as shown by the plot. While India as an average is evenly divided on usage of smoking and smokeless tobacco, higher PCI states barring Maharashtra, Karnataka and Gujarat smoke tobacco rather than chew it. States on the bottom rung of PCI such as Bihar, Uttar Pradesh and the North-East have more than 30% prevalence of chewing tobacco. This fits into the larger trend of developing countries where tobacco prevalence is registered highest among the poorer populations, due to availability of alternate modes of tobacco that are cheaper than cigarettes.